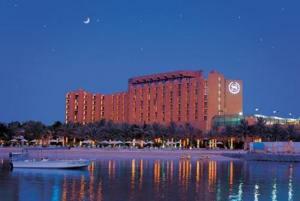 Sheraton Abu Dhabi Resort & Towers, Abu Dhabi discount hotels and accommodation. Overlooking the Arabian Gulf, the Sheraton Abu Dhabi Resort& Towers is strategically located in Abu Dhabi's most prestigious and refined neighborhood. Our hotel is a testament to understated elegance with a distinctive design, superb location, and outstanding service. We are within walking distance of the shopping and commercial district and only 37 kilometers from the airport. Spacious quarters with unprecedented views, the finest contemporary international cuisine, five-star accommodations, and full-fledged conference and banqueting facilities have helped us earn a reputation as one of the finest hotels in Abu Dhabi. View photos, room descriptions and make online reservations at Sheraton Abu Dhabi Resort & Towers. Save on room prices at Sheraton Abu Dhabi Resort & Towers, Abu Dhabi.